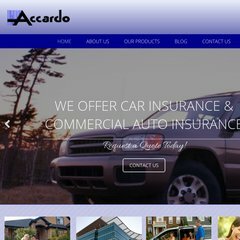 www.Accardo.com - Accardo Agency Inc.
Age: It went live on October 15th 1998, making it over 19 years, 6 months old. ns57.1and1.com, and ns58.1and1.com are its DNS Nameservers. It is hosted by 1 1 Internet Inc. Pennsylvania, using Apache web server. Accardo.com's server IP number is 74.208.62.198. PING www. (74.208.62.198) 56(84) bytes of data. Pinging the server, resulted in a 0.858 ms response.